Most of the known exoplanets were discovered from periodic variations in the host star's velocity. Only a small fraction of these will have the orbit inclinations that produce transits for Earth observers. For Jupiter-size exoplanets with close-in orbits the chance for transits could be 2 to 10% that the planet will transit in front of the star, causing fades of 1 - 3 % (10 to 30 mmag) and lasting 2 or 3 hours. Very few of the 250 or so stars known to have exoplanets have been observed sufficiently to know if transits are also occurring. However, the radial velocity data are usually adequate for predicting when a transit would occur if the inclination is sufficiently close to 90 degrees. The TransitSearch web site lists these times for a large number of candidates as a service to observers interested in ruling-in or ruling-out the presence of transits. Most attempts to find a transit for candidate stars in the TransitSearch list are destined to be featureless, but consider that the payoffs are big for actually determining that transits exist. Consider the case of GJ 436! It languished on the TransitSearch list for a couple years before an amateur/professional group discovered that transits were occurring at the times listed on the TransitSearch web site. When I was a member of the XO Project Extended Team of amateur observers it was common to observe candidates that turned out to be "blended eclipsing binaries" that mimicked exoplanet transits in the wide field survey camera images. In fact, there were so many "EB blends" that it became customary to assume that each new candidate on the XO list was going to be another EB. My reason for explaining this is to convince you that your chances of discovering a new exoplanet using the TransitSearch list are comparable to your chances of co-discovering an exoplanet by observing as a member of a group of amateurs who are privy to a secret list of wide field survey camera candidates. 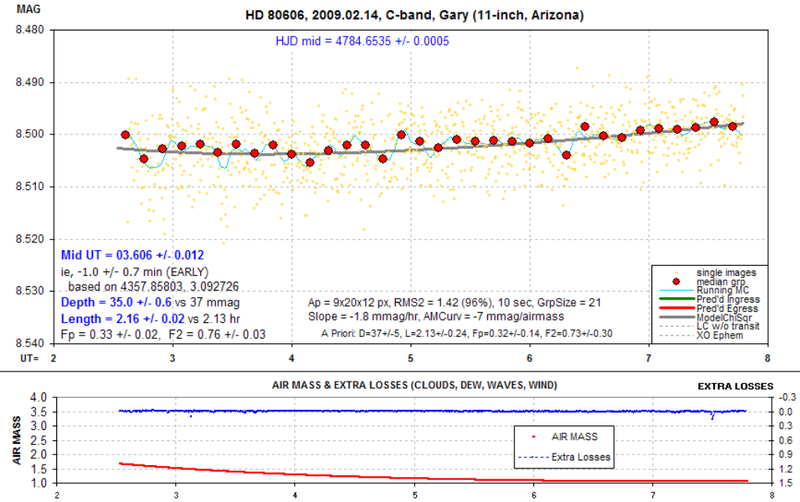 In the next section of this web page I'll place light curve plots for observations submitted to the AXA. Most of them, of course, will be featureless, because only a small percentage of the TransitSearch candidates will exhibit transits at the predicted times to look for them. Please understand that featureless LCs are useful; they can be used by the professional astronomers to rule-out orbital inclinations near 90 degrees, which is an additional (small) constraint for modeling the planetary system. Material for this exoplanet system has been moved to the following link: hd68988. I declared the possibility for transits of this exoplanet system "dead" on March 29, 2009. 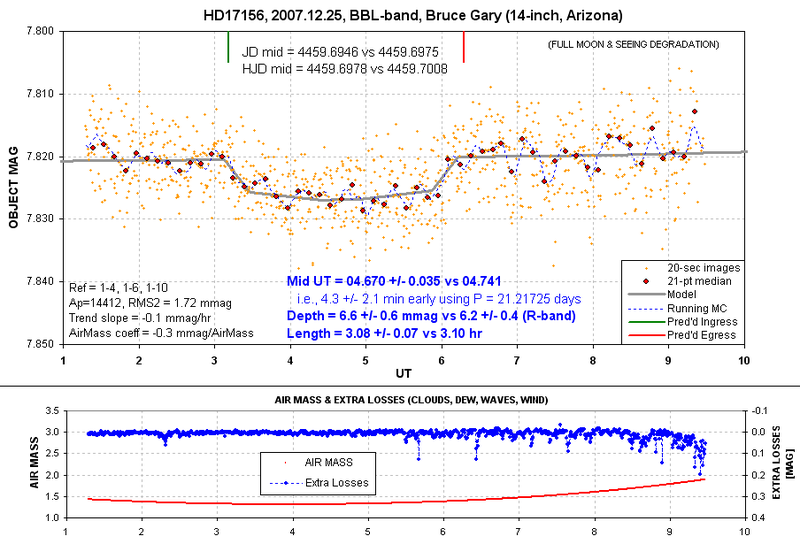 Greg Laughlin alerted the astronomy community about an opportunity to observe a possible primary transit of HD 80606b on Feb 13/14, 2009. The prediction is based on his observation of a secondary transit with the Spitzer space telescope (using an infrared band) in late 2008. 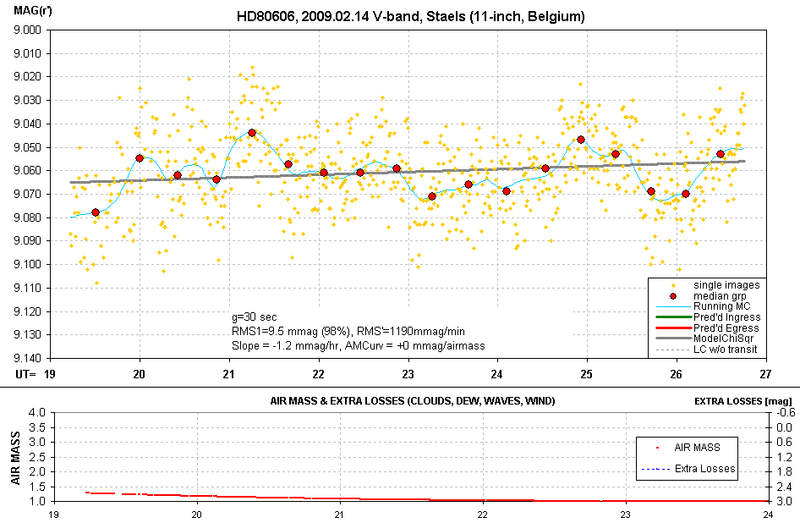 HD 80606 is at RA/DE = 09:22:37.6 +50:36:13 and V-mag ~8.5 ("bright"). Here's a useful depiction of possible transit conditions. 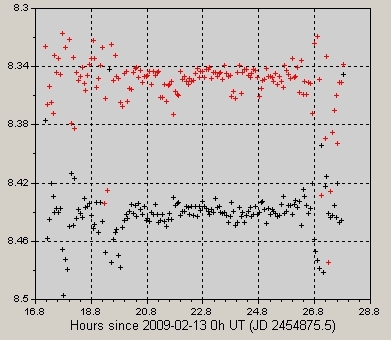 Predicted timing for primary transit of 2009.02.13/14 (courtesy Greg Laughlin). 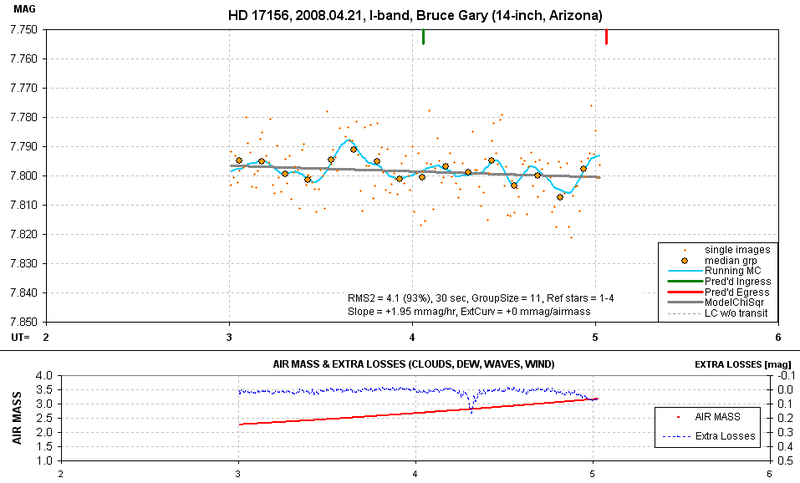 The light curves for this event that follow failed to show the transit, some because ingress and egress did not occur during the observing session, and in one case because of severe noise produced by clouds. I include it here for "completeness," in case some other question arises that may require nearby OOT data. These observations ended ~9.8 hours before ingress (adopting the Garcia & McCullough model). 9213SBL1 Weather was a factor, which eventually forced an observing shut-down. 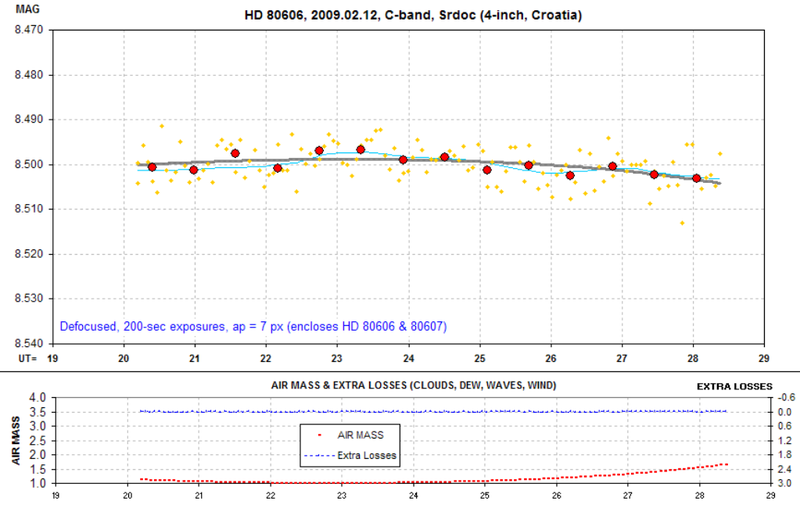 Gregor Srdoc's initial reduction shows no event between ~20.7 UT Feb 13 and ~ 26.7 UT Feb 14. Egress was observed by at least 3 European observers to have occurred at ~01.5 UT, Feb 14 (or 25.5 UT on this plot of Feb 13 UT hours). 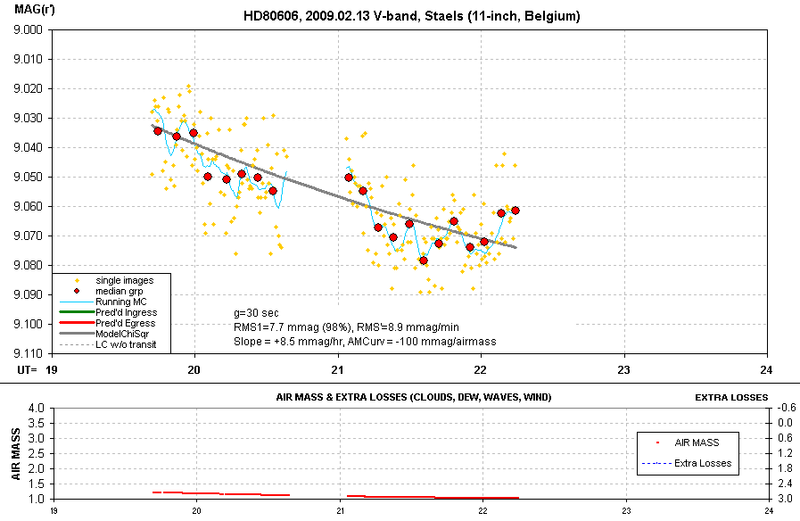 The depth was measured by them to be ~10 mmag for the star HD 80606. 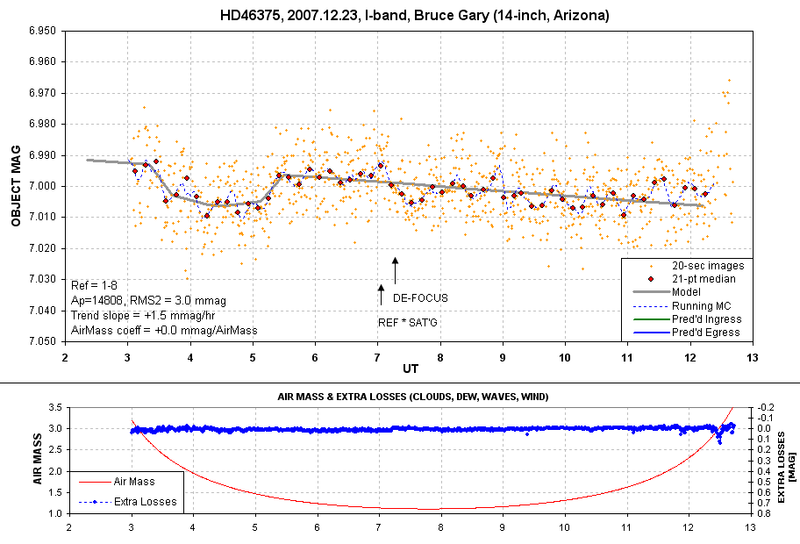 The light curve plotted here is from defocused images requiring a photometry aperture that included both stars. The expected depth for such a LC is therefore ~5 mmag. 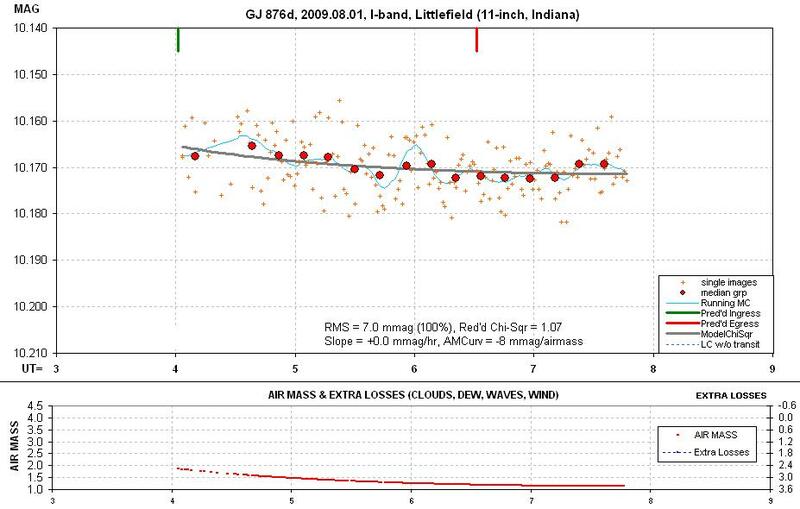 Because the clouds produced large variations of extra losses (seen in following graph) the data are too noisy to discern the egress feature. 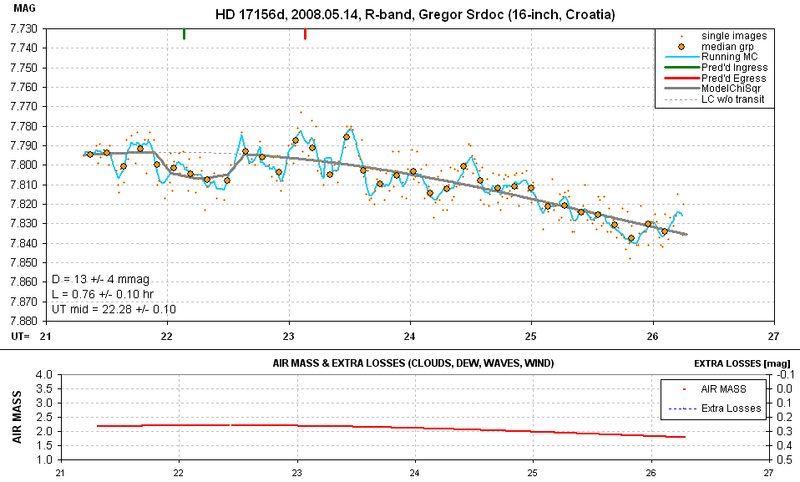 This is a plot of "extra losses" due to clouds for Srdoc's observing (LC plotted above). This is the first half of a 13.1-hour observing session. The rest will be posted later. Amazingly, a transit feature is present with the same depth (and length consistent with the ephemeris-predicted transit for "b") but at a time when no transit is predicted by the 21.2-day ephemeris. What's going on? 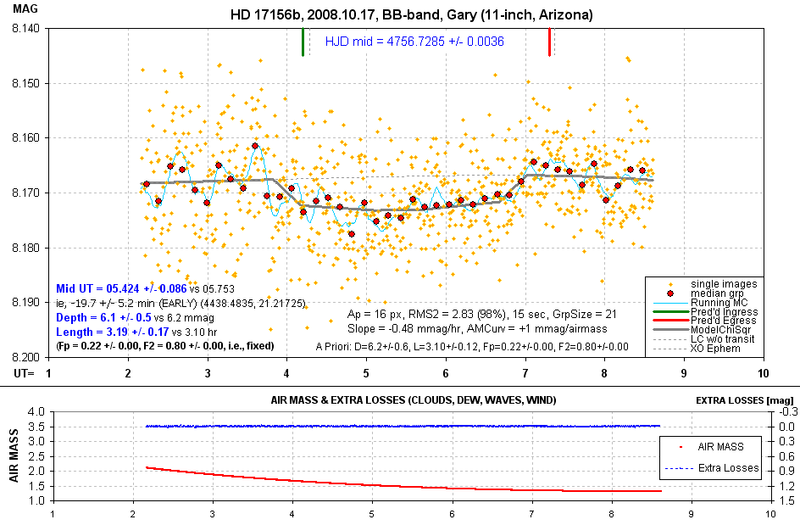 Because of this mystery there is merit in observing HD 17156 at all times (whenever weather conditions are good). 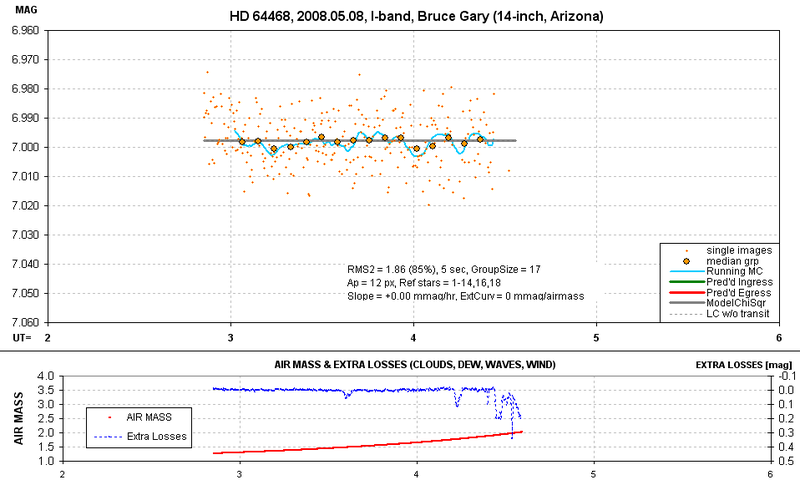 The next plot is an observation at approximately the time that "d" is supposed to have transited. 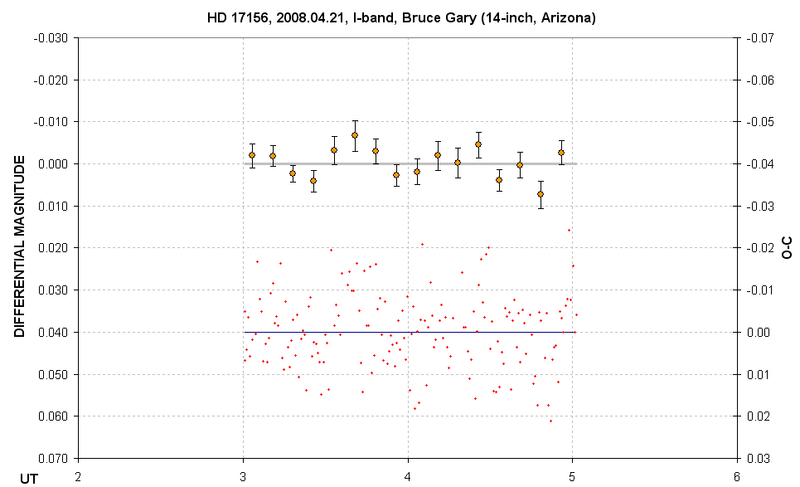 A possible transit for "d" was due at 22.64 UT (based on HJD = 2454548.2219 + E * 1.2376222). At 22.6 UT a tracking adjustment was made so the possible "dip" at 22.3 UT may not be real. 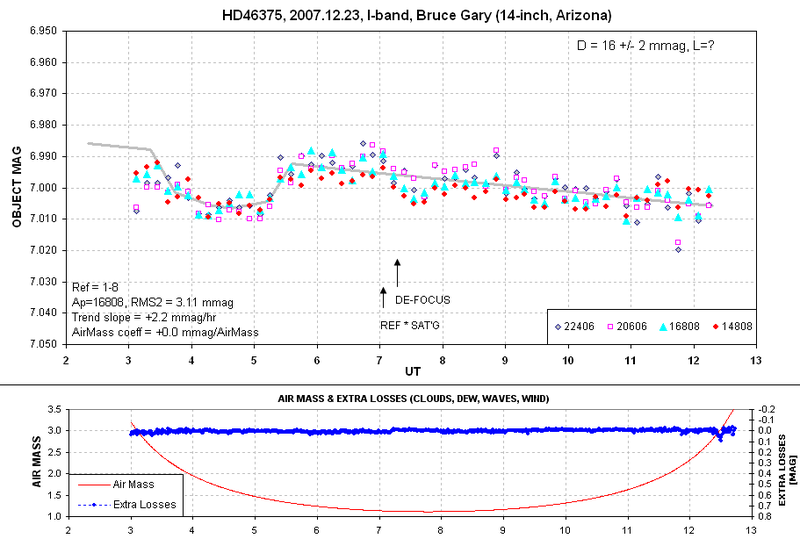 The following plot is another OOT observation of HD 17156 when "d" was expected to transit. Note that air mass was high the entire obs'g session. The last 10 minutes were affected by a SRO wall blocking the aperture. Dynamic aperture was necessary since seeing varied from 5 to 15 "arc FWHM. RA/DE = 02:49:44.5,+71:45:12. The observing season is centered on November 9 (when it crosses meridian at local midnight). (The ephemeris schedule for possible transits is HJD = 4548.2219 + E * 1.2376222). Wind forced an early abort. This flat LC shows that the transit feature seen on 2007.12.23 must not have been real, since that transit predicts a feature in this LC at the times indicated by the green and red tick marks. The observing conditions were much better for this LC than the earlier one. The lesson here is that systematic errors can insinuate themselves into a LC in a most michievous way. Every new and surprising LC feature must be verified wither by a repeat observation or a simultansous observation by another observer. 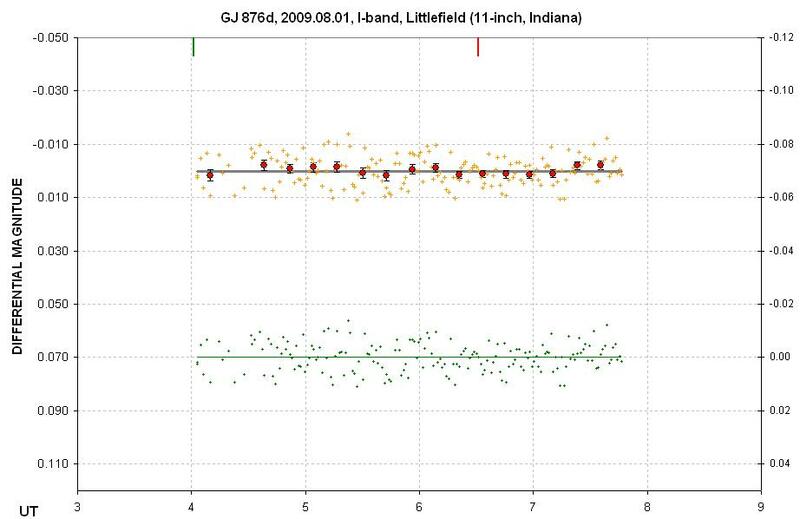 Note: This field is difficult to observe because of a star 10 "arc to the northwest, 2.7 mag fainter. The presence of this star renders the LC vulnerable to systematic effects caused by seeing changes and needed focus changes (unless the seeing is very good). 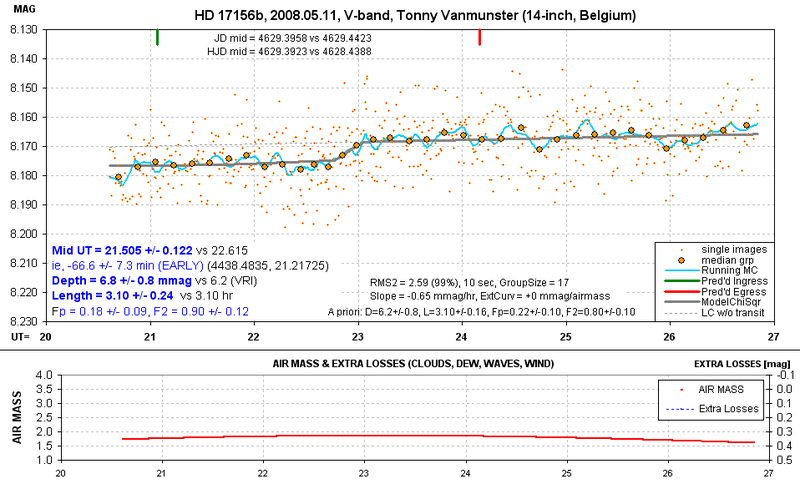 Therefore, the 11 mmag "transit feature" at 4.4 UT in this LC is questionable. As a check I processed all 1174 images using 4 different aperture sizes; they all show this feature. 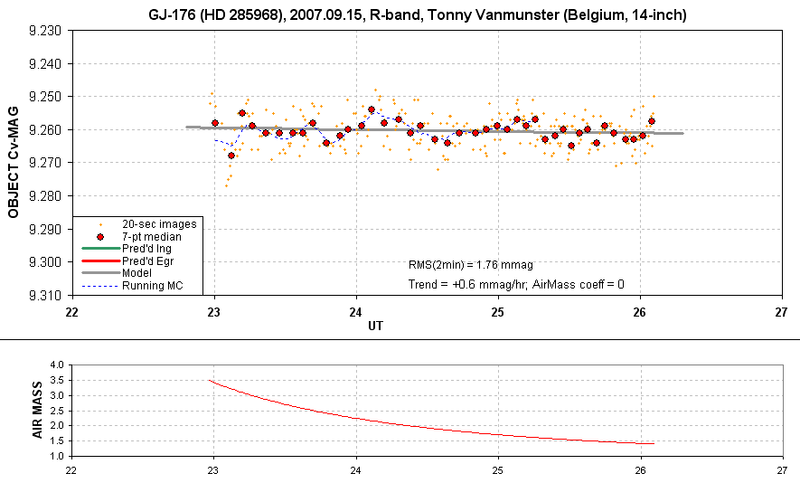 Model's transit depth = 11.5 ± 1.5 mmag, length = 2.15 ± 0.20 hr, mid-transit = 04.43 UT (2007.12.23 UT). The "transit feature" in this LC is compatible with the predictions (that are based on a central transit). If the transit feature is real, then comparing the observed length and depth with the TransitSearch predicted central transit values allows for the estimate of the impact paramter, b (central miss distance normalized by the star's radius). My tentative solution is b = 0.63 ± 0.08,0.10 and Rp/Rs = 0.102 ± 0.005. Since B-V = 0.85, then Rs = 0.83 * Rsun, which means Rp/Rj = 0.82 ± 0.04 (where Rj = Jupiter's equatorial radius). Here's a LC plot using the 4 different aperture settings that minimize the effects of the nearby star. The apparent depth for the average of all aperture choices is greater than for the small aperture choice used in the previous LC (the symbol 22406, for example, means the signal aperture has a radius of 22 pixels, the gap annulus width is 4 pixels and the sky background annulus is 6 pixels wide). This 16 ± 2 mmag depth is essentially the same as the maximum calculated by TransitSearch (15.1 mmag), which could be accounted for with an impact parameter of zero (central transit). 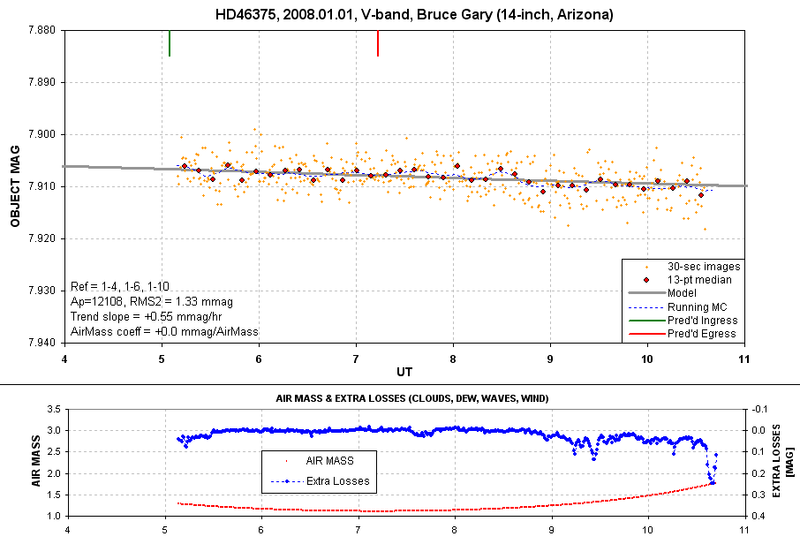 The first few data points are "noisy" due to their high air mass. At the present time JD = HJD - 7.7 minutes for this object.